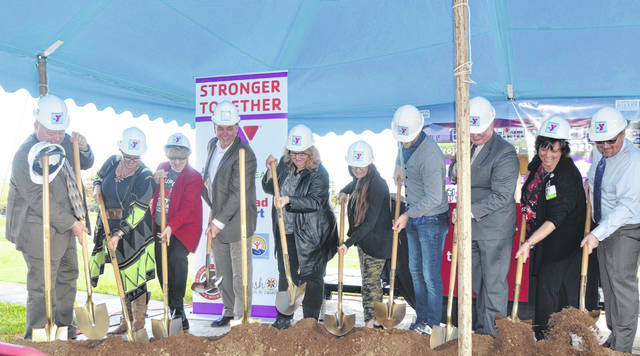 The Wapakoneta Family YMCA Board of Directors and its partners break ground for its new $7.5 million expansion during a ceremony Monday at the Wapakoneta Family YMCA. WAPAKONETA — After a nine-month campaign, the Wapakoneta Family YMCA and its partners have officially raised more than the required $2.5 million for its 2020 expansion. The $2.5 million will go toward the $7.5 million project to expand the current Wapakoneta Family YMCA. The expansion will add another 27,000 square feet and renovate more than 5,000 square feet of existing space. The expansion is expected to be completed by 2020. The YMCA has partnered with Mercy Health-St. Rita’s Medical Center, Nourish U, Coffe Amor, Head Start and United Way for the project. The project was financed by MinsterBank, Superior Credit Union, First National Bank and Home Savings Bank. The expansion will include a rock climbing wall, a therapeutic heated pool, a teaching kitchen and a lunar module-shaped play area. Mercy Health will be expanding its practice in the facility, which Zwez said will help bring healthcare to Auglaize County residents. Head Start will have two new classrooms in the facility, which Zwez said will provide more families with the chance to learn and grow in a safe and fun environment. The YMCA will also be the home of the third Coffe Amor location and it will also be a stationery location for Nourish U.
Ohio Rep. Craig Riedel, R-Defiance, said that he was proud of the joint effort between Wapakoneta Family YMCA Chief Executive Officer Joshua Little, the YMCA board, the City of Wapakoneta and the community. https://www.limaohio.com/wp-content/uploads/sites/54/2018/11/web1_YMCA-2.jpgThe Wapakoneta Family YMCA Board of Directors and its partners break ground for its new $7.5 million expansion during a ceremony Monday at the Wapakoneta Family YMCA.